The recent DEMB Event in Amsterdam chose extra wide Cyclo 200 projection surfaces and elegant white Molton curtains by ShowTex. Unlimited Productions was in charge of the full technical production. 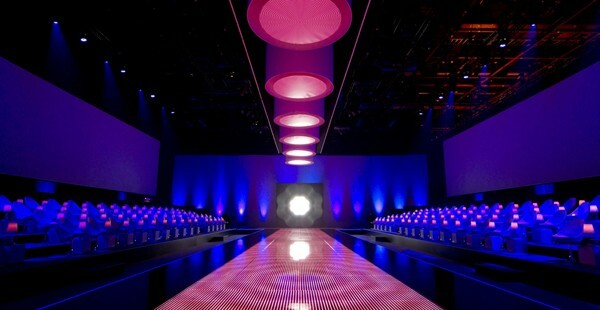 A large catwalk in theatre style optimized interaction between the host and audience. All presentations were shown on four widescreen projection surfaces made of ShowTex Cyclo 200. ShowTex also installed 8m high white Molton curtains, which transformed the lounge area into a stylish coffee house.